AMJ Comms | Did I pass the mother-in-law anxiety and depression test this weekend? Did I pass the mother-in-law anxiety and depression test this weekend? Add to that supposed son-in-law stress, the idea of flying for someone with a fear of flying (a common issue amongst folk with anxiety); driving several hours across the north of Ireland, including in Donegal, with Ireland’s worse – and often unqualified – drivers; a boozy Irish wedding for someone who has given up drink (7.5 months and counting); and late nights and time away from home for someone who loves being at home and even finds being late at work a stress and you have a catastrophic cocktail. This was my weekend. This was a really big test of my mental health and wellbeing. This was a chance to see if my handling strategies for my stress, anxiety and depression would stand some big triggers. Before we get into the match report, let me just put Les Dawson and co right. Perhaps I am am unusual; perhaps I am in the minority; perhaps I am just lucky. But, I have a fantastic relationship with my mother-in-law. She is a legend. I love her and my father-in-law and consider them to be my family. Not my in laws, but my own flesh and blood. So despite the fact that the prospect of seeing Mr and Mrs O’Neill this weekend was a positive developmentment for me, there were plenty of other stress points or potential triggers ahead. I reflected on this several times with Dr J over the weekend as we both could see a huge difference in my state of mind and ability to cope with the things that I encountered. I don’t want you to get me wrong. I am not writing this out of some smug, self- congratulatory instinct to point out how wonderful I am, or to try to pretend that the things I dealt with this weekend were equivalent to climbing mountains, working a 12 hour shift in A&E or spending the day down the pit. But one thing I’ve learnt over the last few years is to get and savour your victories where you can. Be positive when you can be. Enjoy those moments of triumph. Be good to yourself when things go well. In truth, my weekend was as perfect as it could have been given the various potholes that opened up. As well as the big picture stuff I have mentioned, we had Miss J crying with a sore tummy intermittently throughout the weekend (usually any sickness with her – however minor – throws me into hot sweats, racing heart and the like); partly due to the upset tummy and tears, we were very late leaving home for the airport (again a previously unmanageable situation for me); I drove us to the wrong car park at the airport and had to perform some questionable manoeuvres to get us back on track (entirely driver error from me) adding further delays to our arrival with the clock ticking to bag drop closing; a busy and bumpy flight (not my idea of fun); rain upon arrival in Belfast to collect the hire car (which required a lengthy outdoor walk with just one small umbrella between three) – added to that we had some DVLA drama about our booking and the need for me to “speak to them”; all of this before we even made it within 80 miles of County Tyrone and Team O’Neill. The wedding weekend itself was full of the usual stresses and strains that they bring; deadlines to meet; more driving between venues; strange eating times; lots of loud noise; lots of drunken folk; smokers seemly everywhere you want to go outside for a breath of air; all of us out of our normal routines and lots of waiting around and relying on others and their timetables to do. None of this should be a biggie, but in the past each of these interactions would have induced my anxiety symptoms and, at their worse, sent or kept me into a dark cloud. This weekend; nothing. I was the epitome of an even keel. 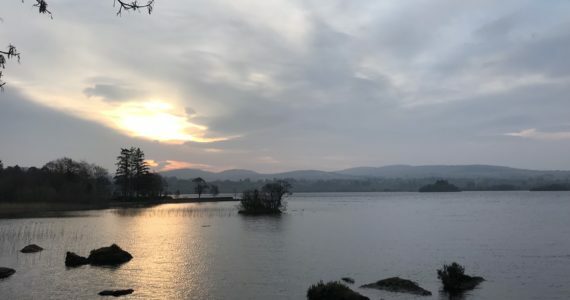 My running by the Lough each morning helped; my non-drinking helped; my medication definitely helped (although I have discovered over the last few weeks that it is also helping make have the most vivid dreams – and not always good ones! ); being a more present, less tired self helped; being kinder to myself helped; my wonderful LFC winning helped; my extraordinary wife helped – as she does every day. It all helped. Why am I writing about this today? Well, apart from finding an opportunity to mention one of the world’s great comedians – and great, bad piano players – I wanted to tell this happy story. I wanted to tell it because it is too easy when you write about mental health – especially your own – to focus on the difficult moments and share the negatives and challenges more than the triumphs. We do that – I do that – I think because we don’t want to take recovery or successes for granted for fear of falling down to earth with an bump. Often also because it is easier for me to use writing as a way of getting difficult stuff out of my head and on to paper. The writing about the tough stuff helps me. But I know that hearing about people having good experiences with their mental health helps people too – it certainly helps me – and I hope that the positive reactions I had this weekend to all manner of previous triggers will give hope to others in a similar boat. In the past, when faced with such stuff, I would need another weekend break or holiday to recover. Last summer, I spent the first half of our big holiday in a very sad, emotional place after letting some small stuff get the better of me. The depression I was in fed a sense of worthlessness and despair about the kind of person I was to be around. I was very low and couldn’t even muster the confidence or energy to go to Fenway to watch the Red Sox – something I had spent 6 months planning. It passed – again with the love of my wife to help me – but it was really half a holiday and the travelling home and the stresses I couldn’t handle on the way meant that I came back feeling worse than when I left. This weekend, I feel the opposite. Like the good cliche goes, I still take each day at a time. I work hard not to look too far ahead and not to get caught up in planning away my life and my emotions – as I did for many years. Today feels good. Yesterday felt good. The weekend was good. And that, as well as thinking about Les Dawson, puts a smile on my face.